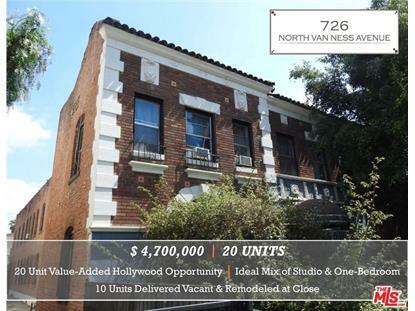 for $4,700,000 with 3 bedrooms. This 9,508 square foot home was built in 1928. The Van Ness apartments is a 20-unit apartment building constructed in the 1920's. 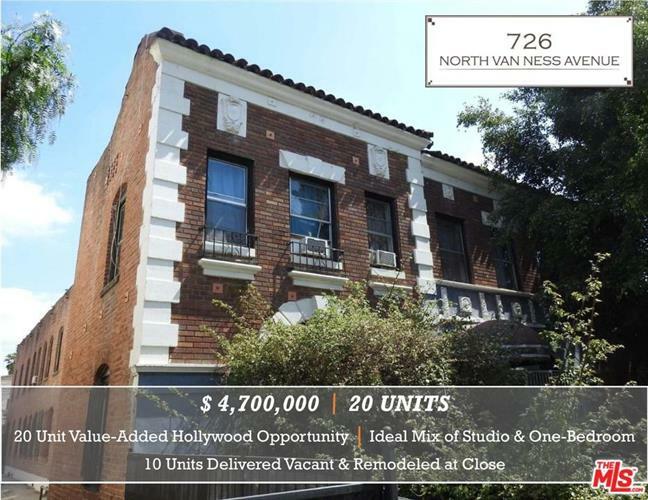 The two-story structure is situated steps from Melrose Avenue and across the street from Paramount Studios. The owner is currently operating some of the units as furnished short-term rentals and approximately ten units can be delivered vacant at the close of escrow. Most of the units feature original wood flooring, arched doorways, build in cabinetry, ceiling fans, exposed brick walls and remodeled kitchens and bathrooms. The building is individually metered for electricity and features a patio area in the rear of the property. The property is considered a substantial value-added opportunity as it is ready for a light cosmetic upgrade of the common areas which will assist in achieving high lease rates for vacancies. In addition, the other units have lease rates lower then market which will provide excellent upside to a new owner.